Product Description: California Baby’s Calendula™ Lotion works to soothe and hydrate skin naturally! Calendula (kal’ len’ dula) is commonly known as the Pot Marigold flower, and has been used for centuries to nourish sensitive skin. This lotion is infused with rosemary extract, featuring antioxidant properties, and vitamin B5 that are blended into high quality, cold pressed vegetable oils (meaning no solvents were used for their extraction) that are non-greasy and absorb quickly. Scented with our calming blend of essential oils that include French lavender promoting calmness and relaxation, this lotion is lightweight, and leaves skin with a long-lasting satiny finish. 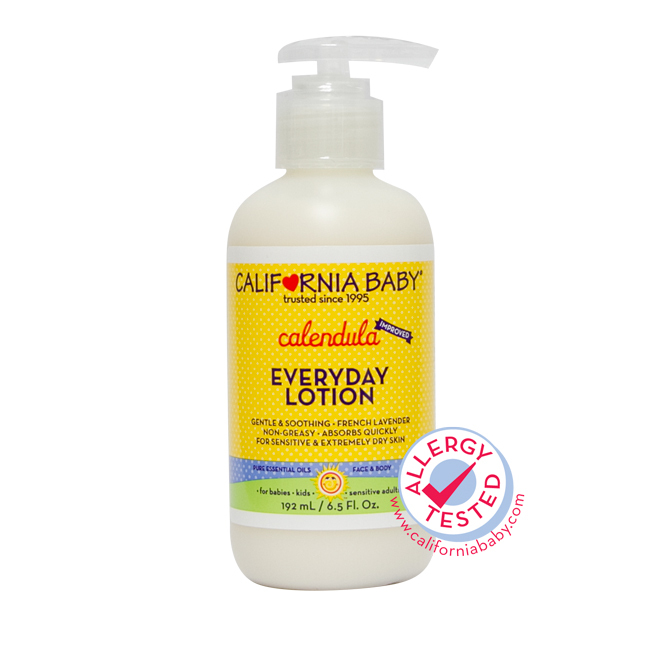 California Baby’s Calendula™ Everyday Lotion is gentle enough for everyday use and is recommended for those with sensitive or irritated skin. Keep skin soft and hydrated by making Calendula™ Everyday Lotion a part of your shower or bath routine!